The Bärengässchen is a small lane that even locals often don′t know. It can be found at the ancient heart of the district of Mülln, north of the city centre. It is a part of the Altstadt that rarely attracts any tourists – however, it is one of the oldest corners of Salzburg outside of the neighbourhood of the cathedral. The word "Mühle" means mill in German and refers to the many mills that once stood in this area, utilising the power from the Almkanal, the oldest canal in Central Europe. The oldest sections of the Almkanal can be found in this area, and indeed, the Bärengässchen was not only home to several Medieval mills including the main one of the Prince Archbishop, but is still home to the only mill left today (associated with a local nunnery). Locals know the Bärengässchen primarily for two things: Firstly, an inn called Bärenwirt; secondly, because of its peculiar name. 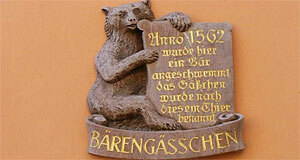 Bärengässchen means "Little Bear Alley"; a name owed to the story that a dead bear was floated into this lane during a flood of the Salzach River in 1562. The inn, which used to be called "Zum Schwarzen Bären" ("Black Bear Inn") is even older than this – its core dates back to the 15th century. To get to the Bärengässchen, you can either enter it from the Müllner Hauptstraße road at the section before the entrance to the Müllner Bräu (coming from the city centre) or just after it. Note that it is not a sightseeing attraction in the strict sense of the word, but rather a nice little neighbourhood that is too often ignored – which is why we thought it should at least feature on visit-salzburg.net, emphasising our endeavours to do a "non-mainstream" travel guide.